The Choreography of Air Shows « "TeresaBruceBooks"
As readers of “The Other Mother: a rememoir” know, I spent the best years of my youth twirling ribbons, juggling clubs, rolling hoops and tossing balls as an almost-Olympic rhythmic gymnast. I designed most of my own routines but occasionally got to work with the national team choreographers. 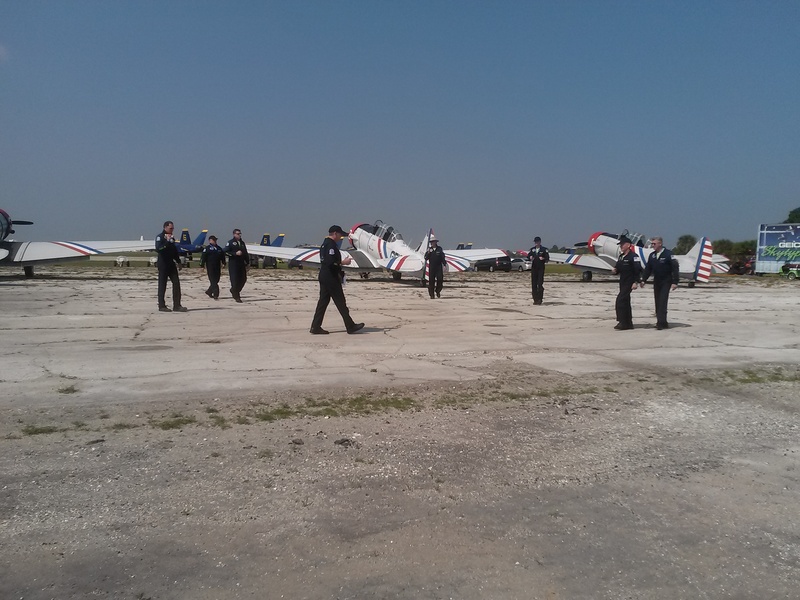 But I never imagined I’d be writing about a different kind of choreography altogether — the demonstration routine performed by the world famous GEICO Skytypers. Instead of gymnasts, I’m writing about pilots — captains of major airlines with thousands of hours flying military planes as well — who spend their weekends flying vintage World War II trainer planes called SNJ’s. If you’ve watched any Hollywood WWII movie, you’ve seen these planes and heard these Pratt Whitney engines. And if you’ve ever been to an air show, you’ve seen aerial choreography not altogether unlike that on the Olympic mat. 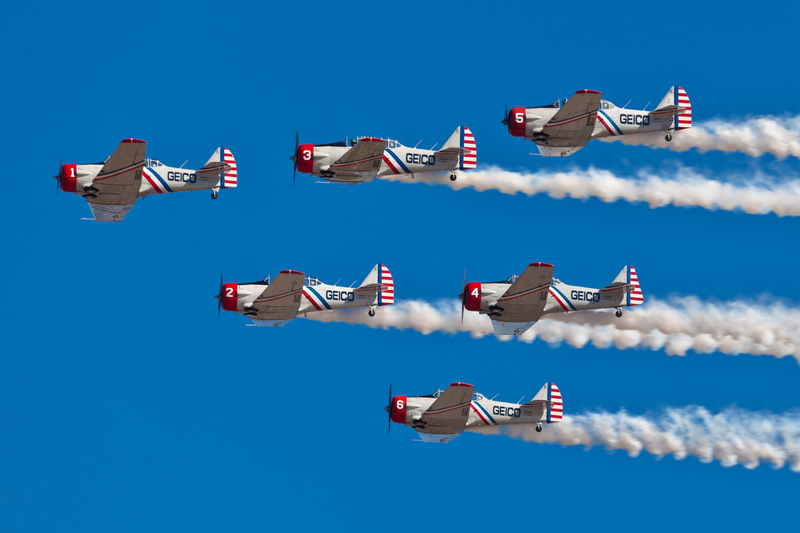 Instead of six gymnasts using their bodies to perform ridiculous acts of flexibility and grace, the Skytypers use six 75-year old planes. A pilot named Steve Salmirs spent the last six months dreaming up a new opening manuever for the Skytypers’ 18-minute precision flying demonstration — and it debuts this weekend at the Melbourne Beach Air and Space Show in Florida. You can read all about it on my official “Skyscribe” blog for the team or follow them on Twitter or Facebook. But here’s a sneak peek of the front part of the new maneuver. I can’t show you the rest because it’d ruin the surprise for the quarter-of-a-million spectators turning out this weekend for the show. Watching the team work on the routine during Spring Training this week in Florida, and in full dress rehearsal today for their season opener was a flashback to putting the finishing touches on a new rhythmic routine. A gymnast goes over the moves in her head, talking each element through with the coach in an almost trance-like method of memorization. The pilots do that in their mobile briefing room — an 18-wheeler outfitted with a giant video screen just for analyzing their performances. Then, just like “marking” new choreography by walking through the positions on the mat, these pilots walk through the whole routine on the tarmac before they ever fire up the planes. Of course the stakes are incredibly higher. 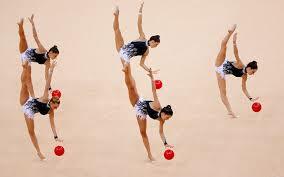 The worst that could happen if a group routine in rhythmic gymnastics goes wrong is a low score. In an air show lives are at stake. Which is why these pilots are as dedicated to perfection as any Olympic athlete. And tomorrow, if that Russian judge dares to score the GEICO Skytypers less than a 10, they’ll have to answer to me. 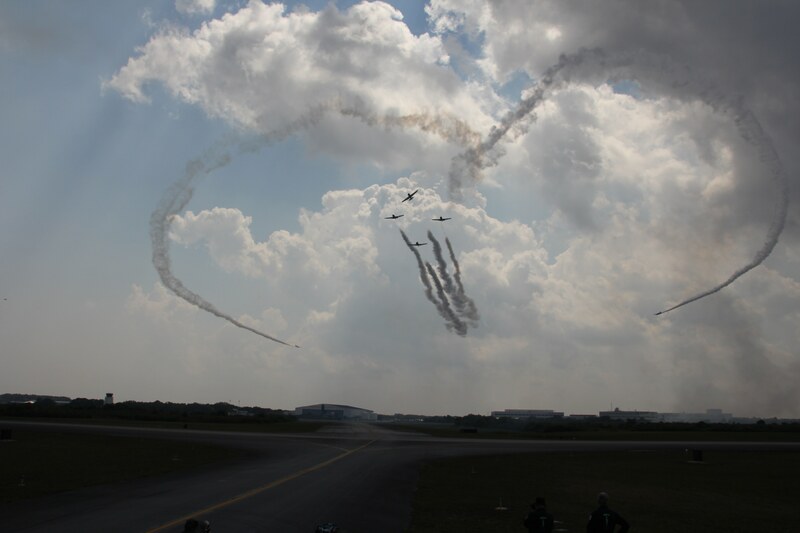 This entry was posted in travel and tagged pilots, rhythmic gymnastics, SNJs, warbirds.